It's been a process that's built and built over 3 years. 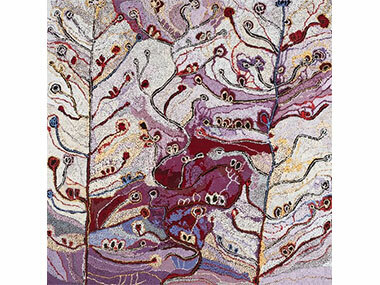 For this year, the prestigious Wynne Prize of $50,000, offered annually since 1897 by the Art Gallery of NSW for landscape painting, has welcomed into its bosom 17 works by Aboriginal artists against 26 by non-Indigenous painters (and two sculptors), and they now require the best part of two rooms to show them off. Two years ago, the Ken Sisters stood alone in taking out the Wynne. Last year, the central atrium of the exhibition was devoted to mighty Aboriginal canvases, and Betty Kuntiwa Pumani took out the prize for a work somewhat similar to her two NATSIAA-winning canvases. This year, there are at least 5 masterpieces, in my humble opinion. And if Wawiriya Burton doesn't take out the prize for her restrained, green and pink work showing the jukurpa concerning small pregnant desert mice (mingkiri), I'm a Dutchman's uncle! She's been denied by judges too often in the past. And this is not only a less-is-more breakthrough canvas for her but it's a tale of mothering and Country, as Burton can explain: “A long time ago, when we were little children, we ran around our grandfather’s and father’s ground, and because of this we grew up strong. Why? Because it’s Anangu country – Aboriginal people’s country – of their spirit”. I should add that the big news today was the choice of the annual Packers' Prize in the 97th year of the Archibald Prize for portraiture – which went to a classic Packers' work showing a familiar face – in this case Jimmy Barnes, captured as a fighter by Jamie Preisz. Which is bad news for Preisz next Friday when the real, $100,000 Archie will be chosen by the AGNSW Trustees, who've never come to same conclusion as the Gallery's packers! Four Aboriginal artists might just get mentioned then, though! Shy Tiger Yaltangki from Indulkana, is a first-timer, joining a considerable throng of fellows in painting a selfie – though I reckon I can see no fewer than four possible versions of him in there, and the one I recognise best from seeing him in life is the one covering his face in embarrassment! And, from just across the way in Indulkana, Vincent Namatjira is offering a triple portrait in the naïve style he's developed that's so different from his grandfather, Albert. I must admit I thought it was a street scene with him resting on paint tins and enjoying the company of a muso and a mate who's going to drive them out bush – three good escapes from the reality of life in a remote community. But it turns out Vincent intends his mates to be Chuck Berry and grandfather Albert, driving the van that replaced camels when he'd sold a few watercolours to continue painting plein air. And then there's Blak Douglas (aka Adam Hill), the proud son of an Aboriginal father of the Dhungutti people based around the MacLeay River, NW of Kempsey. He's painted Uncle Roy Kennedy, a celebrated Wiradjuri artist, renowned for his naive-style depictions of a mission upbringing. “Given Roy’s practice as an etching printmaker”, Douglas explains, “I wished to honour this by depicting him in monotone. This is completely new to me and was much like attempting to speak a foreign language. Metaphorically though, I saw a spiritual man who now lives a lifestyle that is the polar opposite of his mission upbringing, (with) the hardness of a man forged from an ancient past whilst living within a fractured present”. 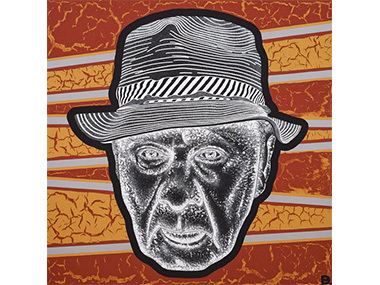 Finally, the Archibald features a small icon by the non-Indigenous Ben Smith of Queensland artist Tony Albert, who wears a haunted look as though he's just come out of one of the remote communities, where he often works collaboratively with artists these days. It's a good, competitive year for the Archies in 2018. I reckon ten of the works hung have a right to be seriously considered by the Trustees – though my favourite is Kathrin Longhurst's image of her daughter Maia; who may not be famous (as the competition demands), but who represents the artist's own past youth and future promise. There are actually three different competitions taking place – and the forgotten one is the Sulman – partly because no one knows what a “genre painting” really is! But I suspect judge (and artist, and Archibald finalist) Angela Tiatia has done a good job, cutting the numbers to 16 and including yet another Indulkana alumna, Kaylene Whiskey, imagining herself on TV. But back to the overwhelming Wynne. A curatorial innovation this year is to share that central atrium space out between Aboriginal masterpieces and not-unrelated non-Indigenous canvases. I've been saying for years that Yaritji Young's work has the distinct feel of early John Olsen. Now they hang together, calling across the room, though the Olsen is a quieter work of his old age. 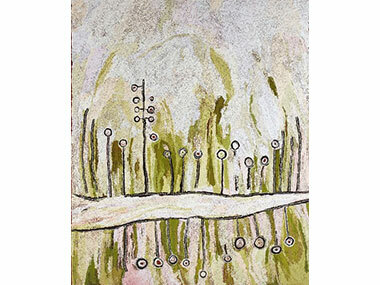 Then, John R Walker, hot from the Adelaide Biennial, has a work that reminds us his Sydney dealer is Chris Hodges at Utopia, a gallery closely linked with Emily Kngwarreye and Papunya Tula Artists. PTA, of course, has a finalist in the Wynne via Yakultji Napangati's heart-piece commemorating Yunata Rock Hole, home of the Silky Pear Vine. Another potential winner is the lesser-known Nellie Coulthard from Oodnadatta, painting the tjuntala tree (native acacia wattle) that grows everywhere there. “When the flowers come, it is my favourite time of year”, she says; “they are so special. My parents taught me how to grind the tjuntala flowers with sand and ashes. We would grind them together into a paste to eat – it’s very sweet and delicious”! And the riches continue into the next room where Phyllis Thomas and Mumu Mike Williams both get pretty political – she bemoaning the loss of two 'stolen generation' sisters to distant Oombulgarri; he regretting the damage to a sacred site by road-builders with the words (in Pitjantjatjara) “Do not pretend to own what is not yours/Never destroy tjukurpa law/Do not touch”. Three Buku Larrnggay works from Yirrkala make, I believe, the first bark appearance in the Wynne – painted by Gunybi Ganambarr, Yalanba Wanambi and Nawurapu Wunungmurra. And Sonia Kurrarra from Noonkanba also pioneers with a classic river work on a glistening polycarbonate sheet. And I haven't even mentioned Peter Mungkari (yet another artist from Indulkana! ), some glorious greens from Maringka Baker, the familiar Ilpili imagery of the Watarru Collective from Nyapari, a 'Seven Sisters' collaborative from Tjala Arts, the Kens, Ray and Sylvia painting separately, Betty Pumani again, and Yurpiya Lionel, who really sums up all of these Indigenous works by declaring: “I am creating anumara tjina tjuta (many tracks of the Anumara caterpillars), like they are crawling, crawling. I am painting this country and this tjukurpa to keep it safe and strong. This is how my people care for our places and our stories”. Nellie Coulthard's rendition of the 'Tjuntala Tree' (native acacia wattle), whose flowers make a delicious dish mixed with sand and ashes!